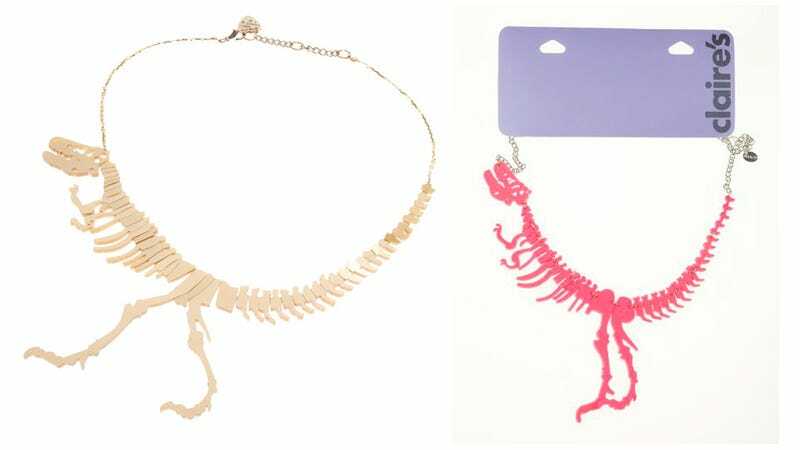 Tatty Devine, the London-based brand known for its witty (and relatively inexpensive) jewelry, noticed something funny about a new Claire's necklace: namely, that it looks virtually identical in design to Tatty Devine's own "Dinosaur" necklace. And that isn't all. Here's another Tatty Devine necklace. And another Claire's necklace. And another Tatty Devine necklace. With another Claire's necklace. There's more at Tatty Devine's blog. The Claire's necklaces are no longer on the chain's Web site. Tatty Devine's dinosaur necklace retails for £114-£132, depending on the material (gold) and size. Claire's is made of plastic. The Tatty Devine fish bone necklace is £39, and the banana necklace is currently on sale for £19.80. It would have been easy for Claire's designers (or the designers of Claire's suppliers) to take inspiration from Tatty Devine's designs without actually copying them. If they liked the notion of putting a dinosaur skeleton on a necklace, Claire's could have done that in its own way — kind of like this necklace, which the chain also sells, and which looks nothing like Tatty Devine! Likewise, Tatty Devine doesn't hold a monopoly on the use of fish bones in jewelry design. Claire's, if it admired Tatty Devine's fishbone necklace, could have done its own version; perhaps it could even have looked a little like this very un-Tatty Devine fish bone key ring it recently produced. But Claire's obviously didn't do that. It just did the jewelry design equivalent of copy and paste. And ripped off an independently owned, woman-run business that handmakes its wares in the U.K. — and which, most pertinently, invests in the work of actually coming up with its own original designs — in the process.